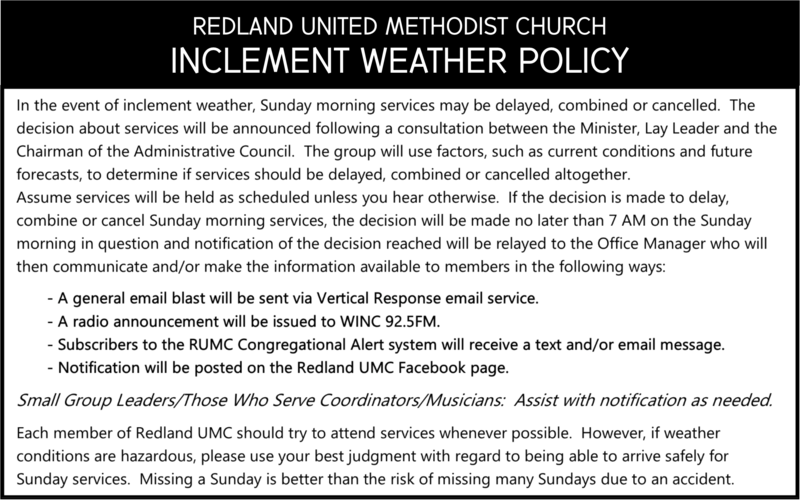 Redland United Methodist Church desires to be a warm, friendly, and open church whose purpose is to grow as a family, grow in Christ, and share God's love through ministry to the community and the world. Welcome to Redland Church on the Internet. We are glad you have found us. We are a Bible-based, Christ-centered, people-focused community church, located just miles from Winchester, Virginia. We are a missional church seeking to spread the love of Christ abroad in our community and the world in a variety of ways. We believe that God calls us to be a people in mission to our community every day and in a variety of ways. So on any given day of the week, you will find us at work - through our full-day preschool and daycare, our after school IMPACT program, and our community Outreach Center. We are host for groups like Alcoholics Anonymous, Al-Anon,and the Boy Scouts and Girl Scouts. and as host for groups like Alcoholics Anonymous, Al-Anon, and the Boy Scouts and Girl Scouts. Come join us as we seek to live as a faith-family, being shaped by God to share the love of Jesus every day. You can also finds us on Facebook. Safe & Convenient Online Giving Now Available! Join us on Sundays for our 10:00 am service and have an encounter with our Living God! Whether it is in favorite old hymns, new songs of praise, the embrace of neighbors and new friends, engaging reflections on life and faith, or the simple beauty of the surrounding mountains, we hope you will feel the very real presence of God in your life. We believe worship is central to our life together, and it involves all of us. Besides regularly attending services, members/volunteers read the scripture lesson, share stories and prayer concerns, bring the Children's Message (a simplified version of the sermon's focus), assist in giving communion, and finally, an adult leader at the Children's Table helps to occupy children's hands with crafts or quiet activities, so young and old can hear the service. There are dedicated organ and / or piano players the 1st and 3rd week; the Redland Rejoicers choir regularly presents anthems at both services, and cantatas in special services during Christian holidays; Praise and Worship teams lead and sing praise songs at the Contemporary format 2nd and 4th week. Volunteers for all of these activities are always welcome to enrich the worship experience for themselves and others. ~ Infant & toddler care is provided for children up to two years from 8:30 AM - 11:00AM. ~ "Wee Ones" provides activities upstairs during the sermon for children ages two - K.
In 1832, Andrew A. Heironimus donated land on Acorn Hill for a meeting house (to be used by all denominations), a school, and free use of a spring. In 1849, a deed was granted to erect Redland Methodist Episcopal Church on the property. The church in Whitacre, VA is thought to have been a log building that stood between the present structure and the school that is located on Redland Road. Twenty years later on April 25, 1868, the first quarterly conference of the newly-formed Gainesboro Methodist Charge was held in the log church. In 1908, a new frame church was built, clear of debt, for $1,055. Church facilities were enlarged in 1957 by adding a second room for worship and three classrooms. In 1993, it was decided the site on Acorn Hill was too small to accommodate future growth, and 13 acres of land were acquired near Cross Junction for construction of a new sanctuary. Groundbreaking for the new church was held on June 11, 1995. In addition to offering more seating for worship services, the building has the addition of new ministries, including A.A. support group, Boy Scouts, IMPACT after-school program, Raise the Roof and a Preschool/Daycare.